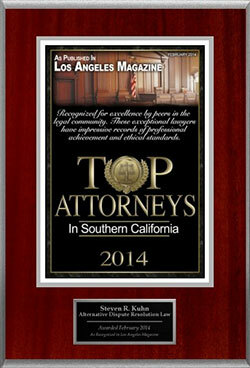 After almost four decades as a trial attorney whose practice has been limited to all aspects of personal injury and civil litigation, Steven R. Kuhn, Esq. is focusing his career on dispute resolution. He has mediated and arbitrated cases in the field of personal injury and business litigation, as well is in other fields such as homeowner association, real estate, employment and construction defect matters. 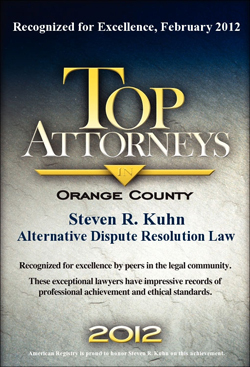 Mr. Kuhn has been recognized by colleagues and clients alike for his professionalism, sensitivity, knowledge, and preparedness. His integrity and fairness are matched by his willingness to persist and resolute calmness through complex and difficult hearings. 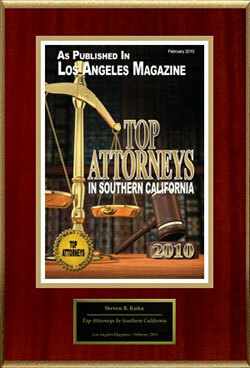 Plus, he maintains a success rate in excess of 90 percent in resolving mediated matters. 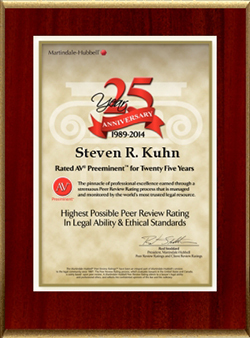 One attorney commented "In my opinion, Mr. Kuhn's solid grasp of the law together with his strong reputation in the community helped me get my matter resolved to my client's complete satisfaction." 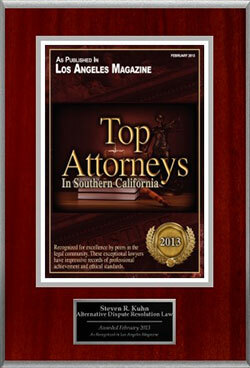 Law Offices of Steven R. Kuhn, an emphasis in personal injury, attorney negligence, business litigation cases, mediation and arbitration (2009-2011). Served as a private mediator since 1998. 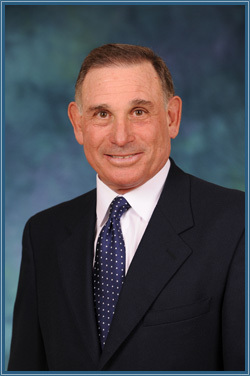 Law Offices of Kuhn & Belz, an emphasis in personal injury, professional negligence, business, construction defect and real estate litigation cases (1998-2009).